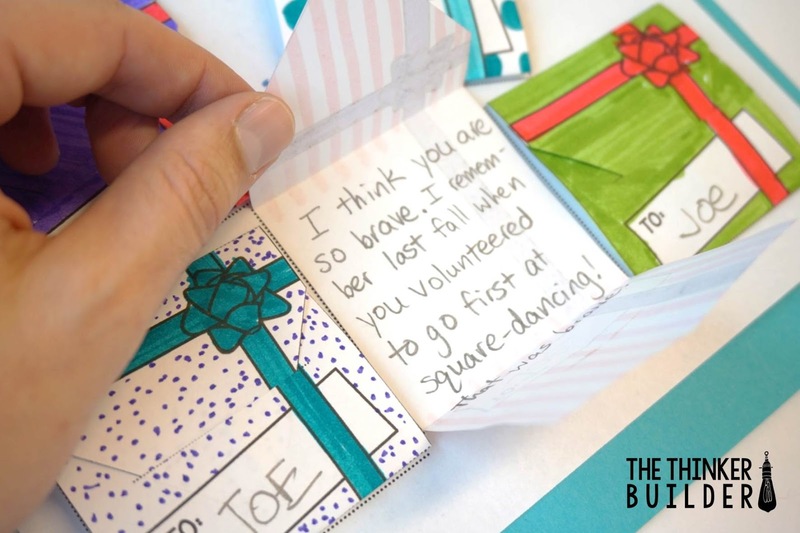 Kids love having the opportunity to give and receive gifts from each other, especially during the holidays. So I took advantage of them. Well not them. I took advantage of their good little hearts. 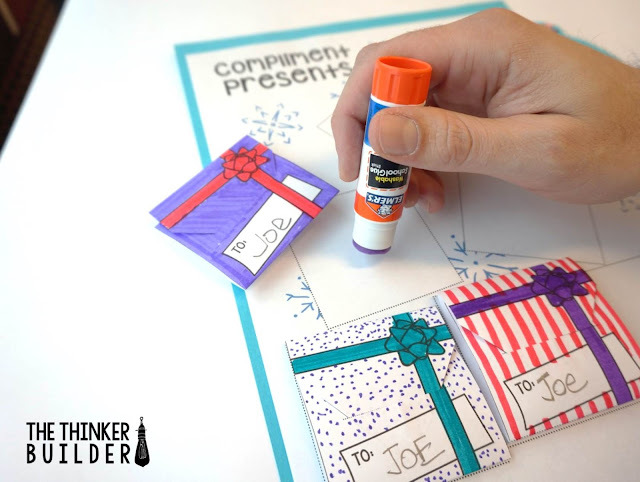 This "Compliment Presents" activity allows students to create free, meaningful, gifts for their classmates (and receive several too! ), all the while building each other up with compliments and helping develop the caring community we teachers are always striving for. 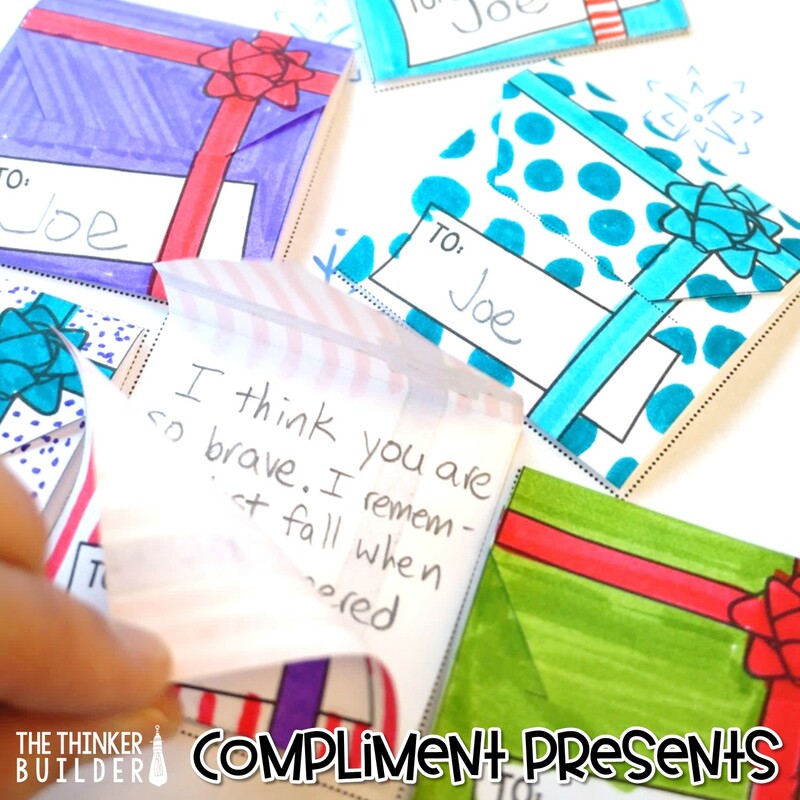 I start out by asking students if they've ever received a compliment, one that really meant something special. I ask them how it made them feel. Receiving a compliment, especially one about who we are as a person on the inside, about our character, builds us up and brightens our day. 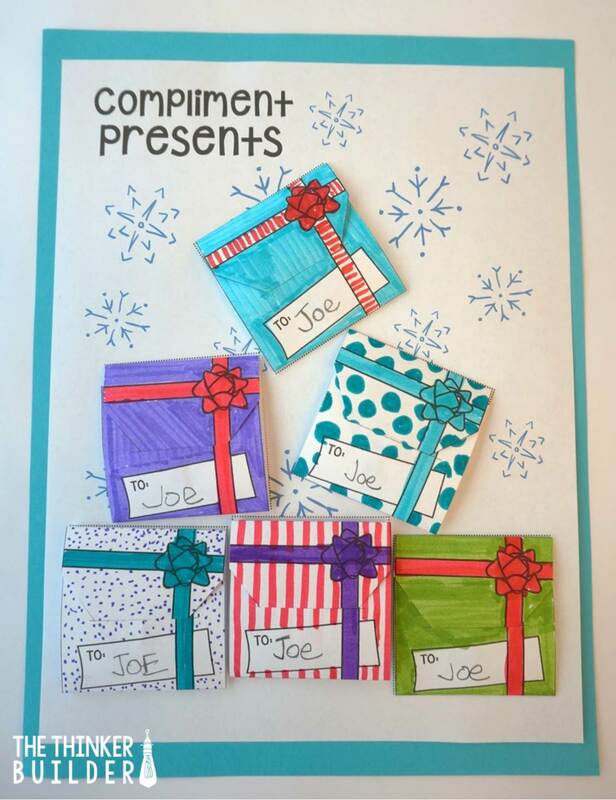 I tell students they are going to be giving each other special compliments wrapped up as presents! Next, we talk about what makes a positive, meaningful compliment. For this activity, I like to be very clear that we will NOT be giving any compliments about each others' appearance. Even though this type of compliment can make us feel good, what we will be complimenting each other on is the inside of us, not the outside. So, how do we think of really good compliments about each others' character? First, think about someone's actions and words. 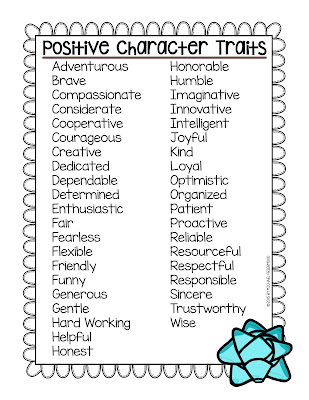 Then think about qualities that are at the heart of these actions and words. 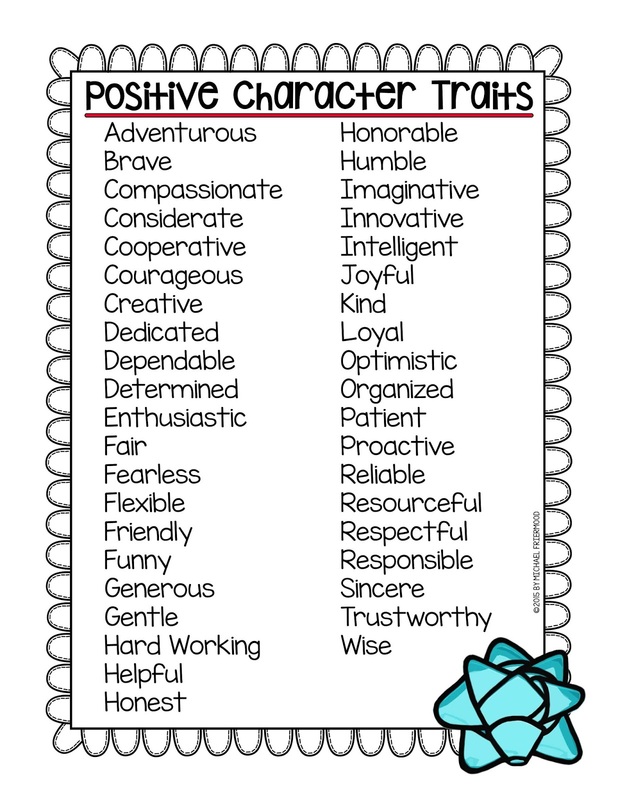 I show a list of positive character traits that they could use for inspiration. I give an example of how to use the list, like, "I could say that our principal is very dedicated. Then I would want to explain why I think she's dedicated, like with an example. I could say when she came to see both of our music performances, even though one was at night, that shows how dedicated she is to her school and her students. Do you see how I chose something that really fits her and I explained it?" Once students have a good grasp of the type of compliment this activity aims for, it's time to decide who each student will write compliments for. 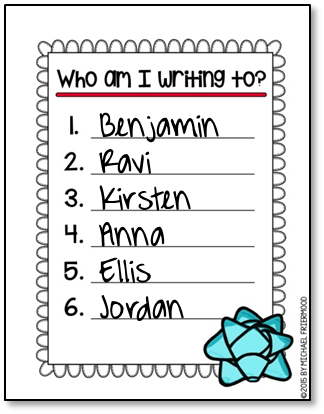 The way I have the activity set up, each student will write a compliment to six different students. I give each student a strip of paper divided into six sections and have students write their own name in all six sections and then cut them apart. I collect all six slips of paper from every student and mix them around in a basket. Then I just go around and drop six random slips on each student's desk, having them check to make sure they don't get their own name. Now is also a good time to remind students that they probably won't get the names of all their best buddies, but to be grateful to be able to brighten the days of these six students. And hey, who's stopping them from giving extra compliments later on, when the activity is over? I have students write their six names on the quarter-sheet and then discard the little slips of paper before they find their way into every nook and cranny of the classroom. 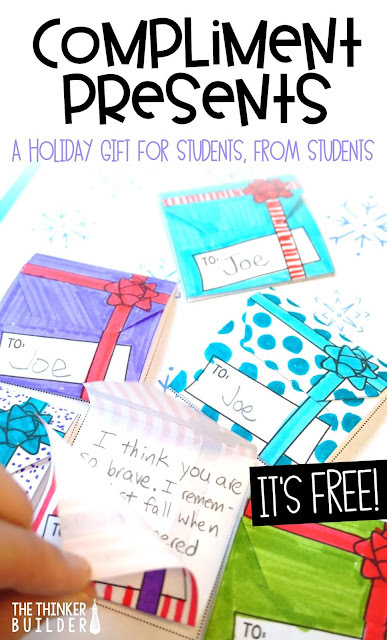 I give six gift-box templates to each student (and keep several extras on hand to replace "mess-ups"). For each "gift box," students cut out the template and decorate it like a present. They write the name of a classmate from their list in the "To" tag. 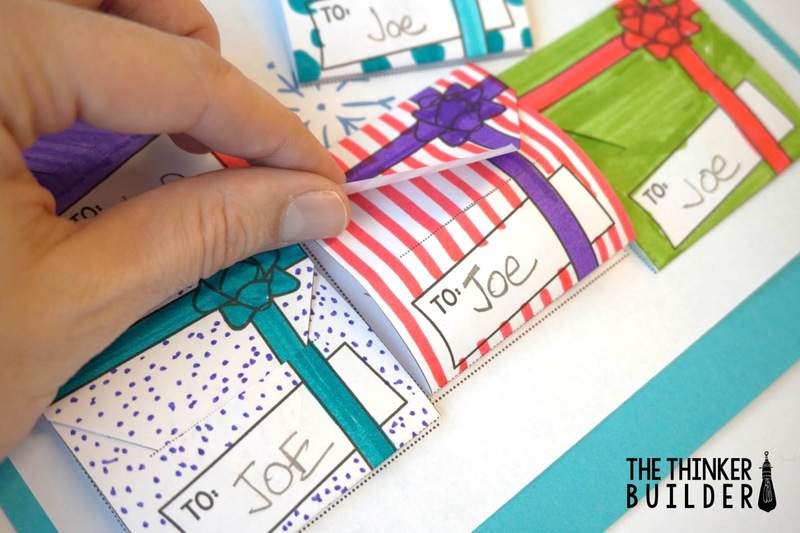 Then they gently fold the template length-wise, without creasing it, and snip along the dotted line. 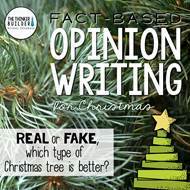 This makes a slit that they will use to keep the present closed. After making the slit, they flatten the paper back out. Next students crease-fold along the dashed lines. Then they write their detailed, positive compliment on the blank side of the paper. Last, they fold their present closed and tuck the pointed tip into the slit. Tah-dah! Students make all six of their presents, one for each person on their list. Sometimes it's helpful to break this part into a couple of time chunks, so students give their full focus to all six compliments. Students take their finished compliment presents and walk around the room and deliver them to the appropriate desks. I preface this stage by telling students that they may NOT open any of their gifts yet. Once everyone is back to their seat, I pass out this "collection sheet." Students use glue sticks to attach the gifts that were delivered to them. No peeking yet! It ends up looking like a big ol' pile of presents! Part Five: Open the Presents! I like to collect the finished "present piles" for at least a day, to let the glue dry. And it's fun to let the anticipation build up a bit before we open our compliment gifts. 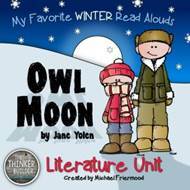 It's especially fun to wait until the last day before our winter break. (It also gives you a chance to take a peek at any particular compliments that give you any pause for concern.) Side Note: I recommend having students open their compliments BEFORE taking them home. If there is a note that is "less than positive," it's easier to confront it and deal with it in class than having parents email you over your break. I always enjoy the smiles and giggles as students open them! 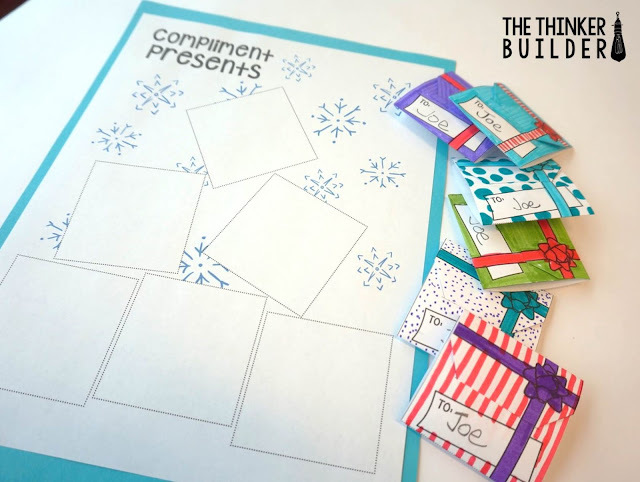 Get all the materials you've seen in this blog post to make Compliment Presents with your students simply by signing up for my free email newsletter! Just click HERE or the image below! Click the image to get the free materials. Did you already read about my Joy Book project? It's a crafty writing activity that makes a great parent gift, and it's free too! Click HERE if you're interested. 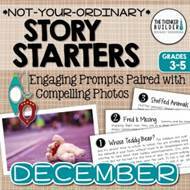 And if you need even more resources for December, check out the ones below!